A fenced yard is convenient when you own a dog, but it’s not necessary. Sometimes people who would like to adopt a dog think they need to have a house with a fenced yard first. Sure, that would be nice, but it’s not a requirement. Dogs can get enough exercise in other ways. It’s OK to have a dog if you live in an apartment. I take my dog for a walk every morning. This is something I would do even if we had a fenced yard. When he was younger, I dedicated even more time to exercising him, and we often went running for an hour each morning. You can take some dogs to off-leash dog parks or beaches to run around. Most dogs don’t use their yards for physical exercise unless someone is interacting with them. Instead, they sniff, pee on things, dig, take naps or patrol the fence. You could hire a dog walker or runner to help you out if needed. About one-third of people in the United States rent their housing, according to the National Multifamily Housing Council. 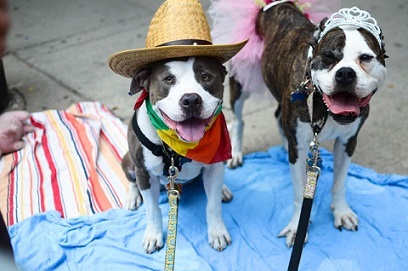 Meanwhile, half of U.S. households have at least one dog, according to the Humane Society of the United States. I think we can assume plenty of dog owners are renters. I would even argue that dogs without fenced yards actually get more exercise because their owners are more likely to walk them. These dogs are then more likely to be better socialized and better behaved in public, meaning they get to visit even more places. 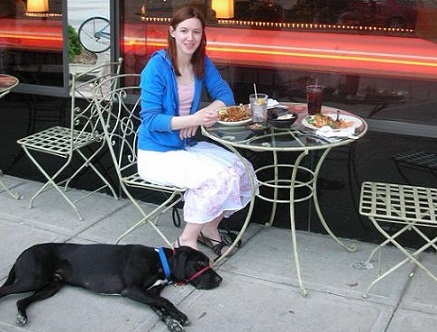 For example, in the top picture, my dog Ace is visiting a Mexican restaurant. In the second photo, he’s visiting a brewery. Amy from the blog Two Pitties in the City lives in Chicago with her husband and two adopted pitbulls (pictured below). Her blog is all about how easy it can be to live in a city and still have bigger dogs, even with no backyard. She said taking her dogs on so many walks has helped expose her dogs to new situations such as parades and festivals. This has allowed Amy and her husband to do even more with their dogs, and she said the dogs are well trained and in great shape. If they had a yard, Amy said she and her husband wouldn’t have the same type of connection they have with their dogs. She said she really enjoys the family time they have together while walking. I also follow the blog We Live in a Flat, which features Donna the adopted mixed-breed dog who lives in an apartment in Singapore. Donna loves to be outside for walks, where she gets to meet other dogs as well as sniff every patch of grass possible, her owner said. One of the great things about dogs is how easily they really do adapt to our lifestyles as long as we provide them with their basic needs. Unfortunately, some rescue groups in the United States require adopters to have fenced yards, but other groups are more realistic. If you’re trying to adopt a dog, keep looking until you find a rescue group that’s more down to earth. Shelters are usually more flexible than rescue groups, and I wouldn’t rule out adopting a dog through Craigslist either. Does your dog have a fenced yard? I agree that dogs without fenced yards often get more exercise and socialization! I have a small, fenced concrete patio bordered by dirt and mulch, which is great when the weather is bad or for that quick early morning potty break, but Ruby gets 1-3 walks per day also. She is such a lucky pup! Every house in our city built since the 60s has a fenced in yard. Owners can’t close escrow until the fence is in place. Good fences make good neighbors. But I agree that a fence is not a necessary requirement for owning a dog. I agree that you don’t need a fenced yard. We have a small one for emergency potty breaks, that pretty much gets used in the winter only. Ours get walks and potty breaks a lot. The sad thing I see on Craigslist is people who live in apartments and can’t make the time to walk the dog and get it the exercise it needs. Why after 4 or 5 years of apartment living are you deciding it doesn’t work for the dog?? As a horse article said if you want more time for your horse, TURN OF THE TV!!!! Dogs are highly adaptable. We went from our comfortable routine to a hotel for 93 days and the only thing that really worried us was Belle loosing hair. After testing for everything we could think of, stress was what we came up with, after we moved into an apartment and settled into more of a routine she grew hair back in two months. While the place we are at has a nice big yard, there isn’t very good walking capabilities. So we hop in the truck and go places to go on walks and we play fetch and tug of war inside more. I must say both of my dogs are listening better and have more manners then they did 8 months ago. And its because of having them with us and making sure they knew what the proper behavior is when we are out and about. I’m glad you and the dogs are doing well after your stressful move and changes in living environments. That is hard on anyone. Saying that most dogs don’t need a fenced yard is a gross overstatement. Some dogs don’t need a fenced yard. Some dogs do. Your post feels like you are assuming that most people live in the same types of places you have and have dogs like Ace. If you ask me what percent need it, it comes down to more specific details – where you live (rural, suburban, urban), regional hazards, dog breed, background of dog if it’s an adult, etc. There are people who live in places where the dog must be leashed or tethered every single time it goes outside if there is no enclosure, due to the traffic or other hazards or due to the dog’s temperament. That’s not healthy. When you have a dog with a wonderful recall and no reactivity issues, it’s easy to forget that your recipe for success – leash them up for a run, go to the park/beach/trails, etc. – is not a suitable option for many other dogs. And even with a lot of training and experience, there are dogs who will never be safe outside off-leash or will always have some fears, sensitivities and reactivity issues that make people or dog populated areas difficult to navigate. I do agree that some people think the yard is the substitute for exercise, which is why I don’t like using “Do you have a fenced yard” as a proxy for “Will this dog get exercise.” Those are two entirely separate questions. But I think it’s a mistake to reassure people that they really don’t need a fenced yard without examining what conditions make the enclosed space more or less important based on the type of dog they are getting. I’m glad you disagree. It makes me think. Yes, my dog is extremely easy and can live almost anywhere. I guess I still believe most dogs do not need a yard. While writing this post I was trying to think of an example of a dog that absolutely must have a yard, and I could not think of one example. I still really can’t think of an example. People will often say certain types of dogs are escape artists and must have a fenced yard, but to me even those dogs would be better off without a yard so they wouldn’t have the opportunity to try to escape. Yes, a yard is definitely a great thing to have for dogs with poor social skills, aggression or terrible recalls. I think characterizing it as “poor social skills, aggression or terrible recalls” makes it sound like a black and white aspect, where the dog is defective or the owner is unwilling to train the dog. That’s unfair. Combinations of environment and breed/temperament can just be poorly suited for an unfenced life. I’ll also add that there is a big difference between living in an apartment or condo and living in a house on a large plot of land that happens to lack fencing. And it’s important to note that play is an important part of exercise for many dogs, which walking and running on leash does not provide. Otherwise, there are reasons some dogs benefit with fenced yards. Some dog breeds are prone to being territorial. This can manifest itself in all sorts of behavioral issues: guarding, barking, general reactivity. It was necessary for the tasks they were originally bred for. You can train around it but it’s still instinctive and if someone is adopting an adult dog, that boat has likely left the harbor. Even with dogs raised as puppies, when they reach adulthood, some can start to exhibit these characteristics, despite good breeding and training. If you have a fenced yard, it can make it much easier for the dog to learn the difference between outside territory that is theirs and outside territory that is not theirs. It is hard to imagine that this actually works if you are comparing relatively non-territorial dogs like labs and goldens to more territorial stranger-wary breeds like pyrenees, mastiffs, some types of terriers, rotties, Dobermans, ridgebacks, etc. But dogs that go on-leash outside for potty-breaks multiple times a day and only get their exercise by walking and running in their neighborhood can develop the sense that this running route or these bathroom locations are their entire territory, which can be more challenging to manage as a behavioral issue. In fact, moving to a place without a fenced yard for a territorial dog can make reactivity issues appear in a dog that didn’t really have them before. This is not uncommon for these types of dogs. It’s not just something that happens to poorly socialized or aggressive dogs. To the contrary, having an identifiable outdoor territory can make it easier to socialize and keep the good sociability in public going for some dogs who come from some of the most maligned breeds. Another reason for the fenced yard is that some dogs have too high prey drive to ever be reliable off-leash in an unfenced area, no matter what the training, especially if you live somewhere with small critters and traffic. And, again, dogs from some breeds are more prone to this behavior. Calling it a terrible recall is unfair because it takes a very high level of training, often from a young age, to override a high prey drive. With some dogs, no amount of training can do this (it’s a major reason why dogs bred to be service or guide dogs can still flunk out of the program & you can hardly blame the breeding or training!). Some people live in places with the type of traffic and prey to make it basically impossible (or gambling the dog’s life) to expect that to work out ok for that dog to be off-leash. This is also where “escape artist” becomes more of an issue because the outcome for the high prey drive dog prone to give chase is very different for the one whose instinct is to come back (hi, retrievers!) and the one whose chases turn into escapes (hi, huskies!). It’s extremely hard to imagine the level of management and training necessary to own one of these dogs. Also, some people just don’t live anywhere with appropriate off-leash areas to go. There might not be any off-leash trails or beaches. The only places might be off-leash dog parks, and those that exist may have too many people/dogs who shouldn’t be there to be safe. I’ve lived in this type of city before (thankfully, I don’t anymore). Some dog parks aren’t even fenced in themselves. Some dogs are not interested in playing with other dogs; they just want to be outside with their people. There just isn’t anywhere for them to go to chase a ball or play tug or chase a flirt pole or wrestle/chase a family/friend dog they know or whatever games they like. These are all dogs I’ve encountered in shelters, rescues, training classes, and the homes of people I know. They are purebreds and mixed breeds. These environments that lack genuinely good places to take a dog for exercise or to play are places I have lived before. The characteristics that make these dogs prone to chasing prey, getting hit by cars, reactivity to people, reactivity other dogs, reactivity to children, guarding/barking, etc. are often the reason that they wind up in training classes or, worse, shelters (and much much worse – injured or dead). Honestly, these reasons are a big part of why I am so much of a lab guy! I know my odds are so much smaller of having to deal with an unreliable off-leash dog or a territorial dog or an escape artist. (I still get to work with managing prey drive – hehe). But when I’m trying to help someone find a dog or help someone keep the dog they already have or trying to help a dog find a family, it would be disingenuous to act like the problem is that the dog isn’t lab enough and the owner isn’t good enough at training their dog. Telling people how a fenced yard can help them and which types of dogs might be better suited for them if they don’t have one is an important part of the process. I think suggesting that most dogs and owners won’t need (or greatly benefit) from a fenced yard is the same type of overgeneralization as requiring everyone have the fenced yard in the first place. Sean, you raise some great points. I can see what you are saying. Thank you for bringing these up. I think I will always be pretty passionate about my belief that you just don’t need a yard for most dogs, but nothing in the dog world is black and white and I’m really glad you brought up all of these issues. I’m really thinking about everything you said, and I’m curious to hear what others have to say too. My dog is great pyrenees/husky across. He is territorial/high prey drive/most things you mentioned. I do not have a yard. I wish I did but I don’t. His reactivity with people in the hall of my building is escalating. You brought up some good points that I didn’t think about. I moved to Vancouver, BC from a 10 acre property which borders crown land. It is very hard to find pet friendly housing in this city and although I am constantly looking for a pet friendly place with a yard it is entirely out of my budget. I lucked out and found a place for us in a co-op which didn’t even ask for a deposit. Do you have any advice on how to approach him thinking that the hallway is an extension of my apartment. I treat when I see a person approach but as the hallways are narrow it is far too close to threshold. Hi Kelly. Sorry to hear about your dog’s reactivity. That is a great question. I just started writing a response about similar experiences I have had, but my tips were just about ways I’ve controlled the reactivity (working on calm obedience in the doorway, using extremely valuable treats for working on “watch me” etc.) I haven’t thought about how to get the dog to think differently about the hallway being an extension of the apartment. That is a great question. I’m hoping some others can chime in. I don’t think you can convince a dog that the hallway isn’t part of the same “house.” That’s not really how dogs relate to property and territory, especially when so much of how dogs are trained and taught is based on inside vs. outside distinctions, like potty training. If hallways and lobbies have the same floor surface as our apartments & require the same behavioral rules, it is completely logical for our dogs to assume that our apartment is one set of “rooms” in a bigger “house.” To really differentiate, you’d have to have a larger set of differences between inside your apartment and outside in the hallway, I think. As to what you can do, treating for a good behavior when you’re around people in the building, like you’re doing, is good. You can introduce the game “Look at me” or “What’s that?” (dog looks at person, then back at you) in a different less stressful place and then add it in the hallway with people at further distance away. You may need friends or neighbors to help out as decoys set up at proper distance down hallway. This way the reactivity trigger becomes the training game for counter-conditioning. If you know neighbors or feel comfortable, your best bet is probably to get your dog to meet them in better circumstances (invite them to your apartment if your dog is good with that, maybe meet totally outside the building if that’s more successful, etc.) and then encounter the same people again with treats in the narrow hallway in a planned way. This works because the dog will expand his realm of who “belongs” in your territory. He won’t stop thinking the hallways is his, but it becomes “ours” because these same people he knows and sees a few times (and have hot dogs and cheese or whatever sometimes!) are part of his extended living group. I know that can be hard when you live in a big city and don’t even know your neighbors, though. But for dogs who have a clearer sense of family/friends vs. strangers, it can help to have them expand their pool of who is not a stranger. Another thing that could help just for managing the situation as you work on the training is to have your dog wear a bright vest that says “Please give me space” or “Dog in training.” Some people will see that and give a wider berth for you with your dog in the building. I have more a question than a comment.We live in a large 4 bedroom/3bathroom house in a suburb,unfortunately we have a small influenced yard. My question is would a Shellie be happy here,being that they are a herding breed? We are lucky enough to have a fenced yard, although I agree it’s not essential. The most important time is that late night pee break or middle of the night upset stomach. Oh gosh, definitely! 🙂 Also for when it’s cold and you’d rather wait inside. We don’t have a fenced yard, and our dog is fine. I would also like to point out, after reading one of the above comments, that my dog has terrible reactivity issues, including leash aggression and fear aggression directed towards strangers. If I had a yard it would be nothing more than a convenient excuse for me to dump him in it and not deal with the problem. As it is, I have to walk him every day, and I take him lots of places. His fear problems are so so much better than they used to be. He even got the highest score on the final exam in our obedience class. My dog gets plenty of opportunities to run and be “free” even though we don’t have a yard. We take him jogging and to dog parks. There are even private dog parks if your dog has problems with other dogs (see Zoom Room). I think whether a dog “needs” a yard depends more on the type of person than type of dog. Great example. Thank you for chiming in. I’ve fostered some reactive dogs that couldn’t go to dog parks, and I was able to find ways to exercise, train and socialize them without a yard too. I did have the benefit of large open areas, where I could take the dog out on a long, long rope to run around. That helped a lot. I think Sean has some great points. I would find it very difficult to live with a highly aggressive/reactive dog in my current apartment space, for example. It wouldn’t be impossible, but it would be challenging and stressful. We have narrow hallways with narrow stairs and lots of dogs around. Other owners allow their dogs to be out ahead on Flexi leashes, and it would be challenging to keep a highly aggressive dog safe from trouble just while going out for frequent potty breaks. There are also kids running around. Perhaps the best thing to take from all of this is that every situation is unique. As you said, it may be more about the type of person and how experienced and willing he/she is than the type of dog. Great point! First, kudos to Jessica for the great work with your reactive/fearful dog. Glad it’s gotten so much better. I agree that some people with a yard would be tempted to dump the dog in the yard and never deal with reactivity issues. That’s a big problem. The dog’s world gets smaller and smaller, and the behavior problems get worse. At the same time, the best way to desensitize and counter-condition dogs is to be able to control their exposure to triggers. A dog living in the state of stress and anxiety due to circumstances like Lindsay’s apartment would be extremely challenging to work with. You can have lots of successful training and outing undermined by bad daily or weekly experiences with other people living in your apartment who just don’t get it. And the dog has to go out for potty at SOME time, not always before 5:30 AM and after 10:00 PM. The dog is stressed, the people are stressed. It’s selfish to deliberately place a dog in an environment that the dog experiences as constant stress without the likelihood of being able to alleviate that stress. But, of course, there is a difference between apartment life (or more specifically busy apartment complex life) and the issue of fenced yards. We second that opinion and would also add that because you live in an apartment does not mean you can’t have a larger dog. In Europe, Mom had a lab/newf mix in an apartment, no problem. My Kuvasz sister Katie also lived in an apartment her first two years. We love our yard because we play chase and wrestle out there and it is nice to lay in the grass on a beautiful day, but Our exercise comes from walks and other adventures. The same is true with an apartment, if you exercise the dog, it doesn’t matter. The people that need the yard are the ones that don’t walk their dog and need a place to use as a bathroom. That is out take! We are in the process of putting up fencing now. It is for a supervised yard, so we will be interacting with the dogs. I do agree that many dogs without fences get more exercise and socialization than those with fences. I finally live in a home with a fenced yard! However, until this past year I lived in a condo with the dogs without a fenced yard. Living in the condo with Linus and Stetson was great and we never had any problems not having a yard. I must say that we did go on more walks when we lived in the condo. Glad you guys have a yard now, but I bet you still go for lots of walks. This is perfect and I will be sharing! I hear people say all the time that they can’t have a dog because they don’t have a yard, or they only exercise their dogs in the yard, or they’re so happy they have a yard for their dog. I have LOTS of conversations along the same lines as your post. I was very impressed when a shelter in small city in the Bay Area united with the police department and educated dog owners about what they termed “back yard syndrome.” It’s when dogs are only exposed to the back yard and they lose their health while gaining weight, lose their socialization and become territorial, etc. It was a great effort – I think they stopped a few years back but it was really impressive! Thanks so much for sharing my post. I also hear people say they wish they had a yard so they could get a dog. While some dogs may do better with a yard, there are plenty of dogs that don’t need one. If someone lives in an apartment and wants a dog, there are plenty of good dogs to choose from. This is a really good point! I’ve got a back yard (which I totally love and always want to go out to ‘check’ on the squirrels), but I also love to go out with Mum- We go and pick Cosmo up from his house next door and walk all over the neighborhood, we know so many people because we’re out and about! You’re a lucky pup, Snoopy! We have a yard with a fence around part of it. You are right, my dogs would never get enough exercise in our backyard. But it is good when you can just let them out to do their job and not worry about them, sometimes they like to go lay on the deck in the summer and although they have a great recall, I can go in the house and not worry about them wandering and still have a watchful eye on them. But agreed, you can work it out without a yard. For dogs that aren’t used to going on a leash, sometimes using a longer leash/rope helps or even a retractable leash. Other than that, it’s just going back to basics and rewarding them for peeing while on the leash. I’m sure they’ll catch on eventually. I have a large blue heeler mix in a condo – lol. I can’t think of too many breeds that could be worse in a condo. I was lucky enough to have him as a puppy though and he’s been well socialized and even attends dog day camp once or twice a week. I also have fields nearby where he can get some running in. My previous dog was a pit bull and also lived in the condo. TBH, the people I know with large dogs in condos get them out much more often than the yarded ones. Also, about folks giving away dogs on craigslist – most of the adds I read it seems like the people had a yard but their kids don’t show interest/etc.